Brainwaves of highly experienced meditation practitioners are different than those of non-meditators. Many people try to use meditation to do something to their brain. They want to quiet it, focus it, energize it, or zap some ideas into it. What some of those people don’t realize is that, while the end results of meditation can certainly do all those things to their brain, the first step in establishing a beneficial and long-term meditation practice is to start with an understanding of what is going on in that brain in the first place. In the past, that wasn’t easy to do. To get a glimpse inside the brain, doctors have to use electroencephalography, also known as EEG technology, to get a graph of the different waves traveling through there at any given time. Most people either didn’t have the access, funds, or time to get hooked up to EEG sensors to see what’s happening inside their head. Alternatively, they might lack a medical reason to do so at all. Now, though, with new affordable wearable technology like the Muse headband, people are able to get a glimpse of their brainwaves – and also personalized, data-driven feedback that will guide them in training their brain. Brain training is a more critical part of meditation than most people realize. As the billions of neurons in the human brain travel throughout the organ’s complex networks, they communicate with each other via small electrical currents that produce a synchronized movement known as a brainwave. Neuroscientists learned that by placing electrodes on a person’s scalp, in the process known as EEG, they can track and visualize those waves. They’ve detected five main types of brainwaves, all occurring in different moments of consciousness. The slowest brain waves, delta waves, happen while you sleep – and are crucial for the rest and relaxation that your brain needs after working hard all day. At the other end of the spectrum are Gamma brainwaves, the fastest ones recorded by EEG. They are the waves considered the peak of physical or mental performance, the kind that occur when you feel like you’re “in the zone” at work, or have a sudden burst of inspiration. 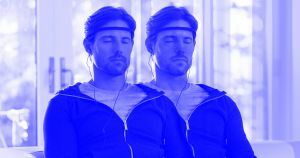 While similarities exist between all human brains, scientists have recently begun to realize that the brainwaves of highly experienced meditation practitioners, such as Buddhist monks, are different than those of non-meditators. For most non-meditators, Gamma brainwaves happen infrequently, and often don’t last very long. But in experienced meditators, neuroscientists have observed that Gamma brainwaves are stronger and more regularly observed. Plus, they have more control over the ease at which they switch between waves. While non-meditators have to wait around for their “aha” moment to strike, it’s easier for long-term meditators to switch their brain into focus mode. Many of those experienced and enlightened meditators got there through hours of brain study, practice, and guidance. That’s a great path for some, but one that most people don’t have the funds, time, or access to pursue. For those people, there is Muse. The sleek, portable headband uses seven small sensors to detect the brain’s electrical activity. Some wearable technology stops there – they simply clock how many steps you’ve taken that day, or how many hours of restful sleep you got. But Muse takes it one step further. In addition to clocking your brain’s activity, it uses a highly complex algorithm to deliver you real-time audio feedback during sessions and usable data metrics post-session to help you improve. That real time feedback is the roadmap to establishing a meditation practice that can help minimize stress, focus the brain, and improve overall well being. The result is data-driven learning and real time feedback that doesn’t just give you the immediate benefits of a meditative session, but also the tools you need to train your brain to be more focused, rejuvenated, and mindful going forward. Neuroscientists have already taken the highly portable product into to the field. Researchers from MIT and Harvard have used Muse to learn more about how the brain classifies pain, and researchers from British Columbia took Muse to Nepal to better understand the minds of Buddhist monks. But the beauty of the product is that it’s not just for neuroscientists. As long as you have a smart device, a few moments, and a brain, you can use it anywhere at any time. And now, you can use it more affordably. As part of a Black Friday deal, you can get a Muse for just $159. It’s a deal so great that if it didn’t have everything to do with bettering your brain, it’d be called a no-brainer. Futurism fans: To create this content, a non-editorial team worked with Muse, who sponsored this post. This post does not reflect the views or the endorsement of the Futurism.com editorial staff.